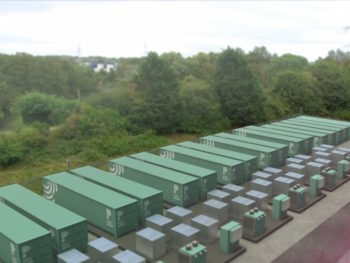 Intended to provide a blueprint for other cities and countries, the £41m Energy Superhub Oxford (ESO) project will see what’s claimed as the world’s largest commercial hybrid energy storage system be deployed to power a 10km network of charging stations. The project is being run by a consortium including Oxford City Council, Pivot Power, Habitat Energy, Kensa Contracting, redT energy and the University of Oxford, backed by £10m funding from the UK’s innovation agency, UK Research and Innovation (UKRI). Together, the partners will lead the 2020 launch of the world’s largest hybrid lithium ion / vanadium redox flow machine energy storage system and a network of ultra-rapid and fast charging stations connected directly to the extra-high voltage transmission system; approximately 100 ultra-rapid and fast chargers will be installed initially at a public charging station on the A34. The network will also run past the city’s two main bus depots, providing the opportunity for their fleets to go electric. epers, tippers and vans. The funding will also support the council to work with a partner offering a ‘Try before you Buy’ programme for Hackney Carriage Vehicle drivers in Oxford. This will assist the transition of the black cab fleet from 100% diesel to 100% electric by 2025. The moves to accelerate the switch to electric vehicles and decarbonise heating for homes and buildings are expected to bring significant benefits when it comes to emissions and public health; the aim is to deliver 20,000 tonnes of CO2 per year saving by 2021, rising to 44,000 tonnes per year by 2032. The project will also come under research by the University of Oxford, together with a UK university-led energy revolution research consortium dubbed EnergyREV and the Energy Systems Catapult ‘Energy Revolution Integration Service’ (ERIS), to produce reports and recommendations that will support the rollout of similar initiatives elsewhere in the UK, and around the world. The announcement comes after the City Council declared a climate emergency in Oxford earlier this year and committed to continue working with partners across the city and region to deliver widespread carbon reductions. Councillor Tom Hayes, Executive Board Member for a Safer and Greener Environment, said: “The City Council is working towards a Zero Carbon Oxford to tackle dangerous climate change in the time available to us to save the planet. Uniquely, this £41m once-in-a-generation downpayment on Oxford will move the Council closer to achieving this vision. 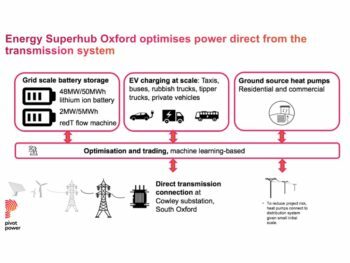 Leading businesses are investing in Oxford because they recognise that we’re already trialling new technologies exactly like Energy Superhub Oxford. Today’s announcement allows us as a city to embrace our technological future.